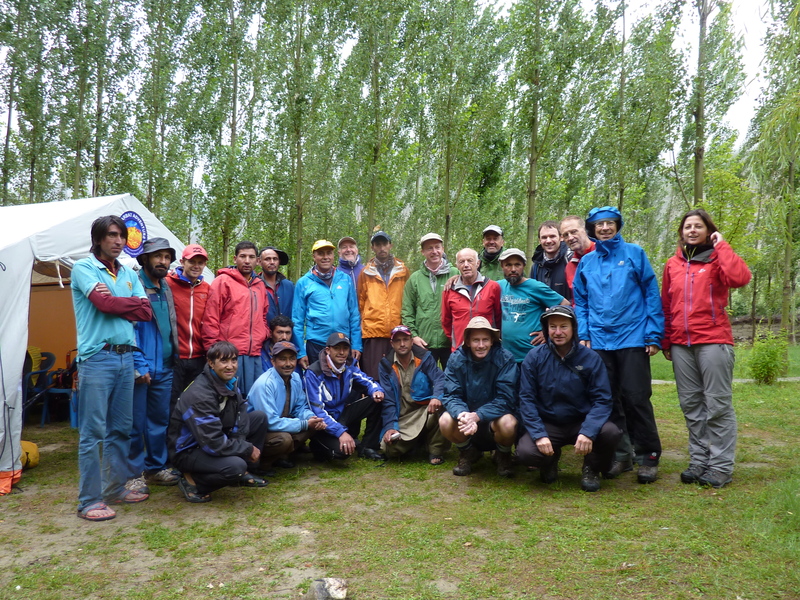 The team met in Islamabad and our first day there was free to make our final preparations for the expedition. 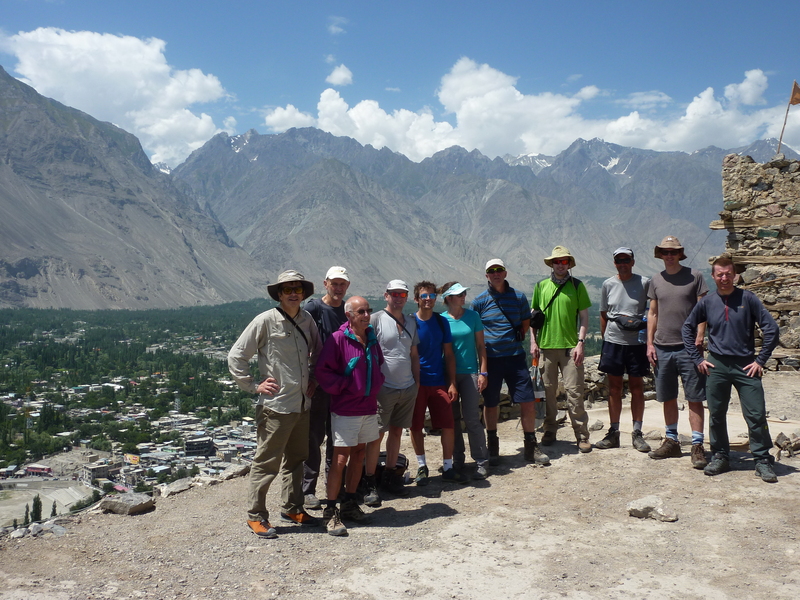 Aside from various gear sorting, kit checking, money changing and food shopping, we had time to visit the Faisal Mosque and drive to a view point above the city. We were some of the only westerners around and were very well received, in fact we turned into a bit of a tourist attraction ourselves with all the locals wanting to take selfies of us. 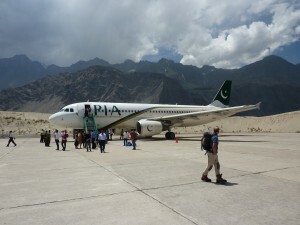 The Faisal Mosque is very impressive and clearly the place to visit and Pakistanis from all over the country were there. 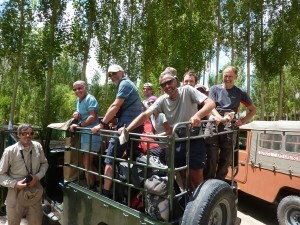 After dinner at our hotel we made an early start to catch our flight to Skardu. The flight went very smoothly and gave us some fantastic views of many peaks including Nanga Parbat (8126m) and a spectacular descent through the mountains down to the Skardu airstrip. 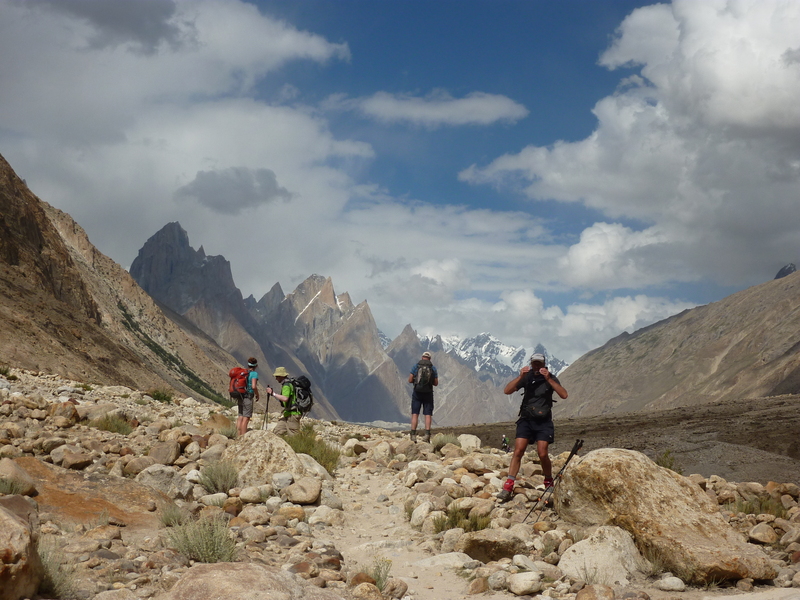 We had two nights in Skardu at Hotel Mashabrum giving us a chance to see the sights while our local trekking team dealt with various bits of red tape and stocked up on all the necessary provisions for the trip. Once you leave Skardu there are very few places to buy anything so it’s worth stocking up. 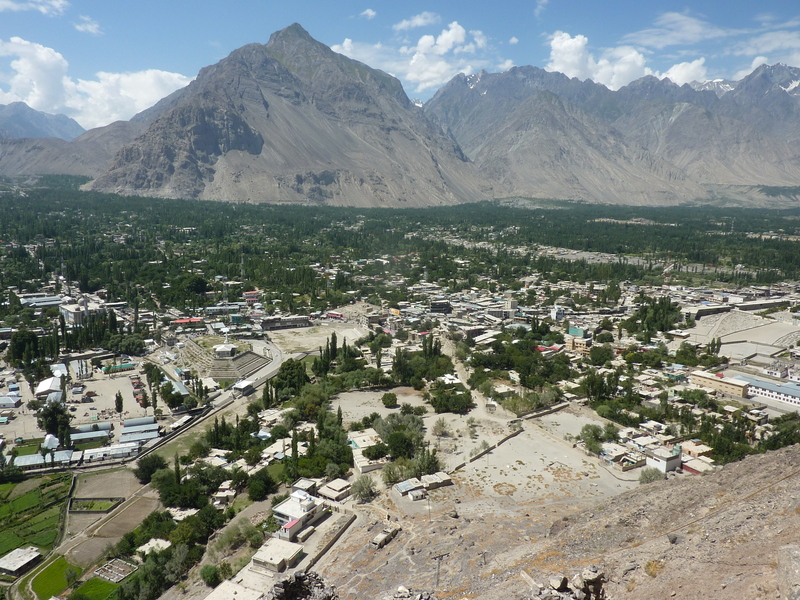 On our free day in Skardu we took a walk up to the 400 year old Kharpocho Fort on the hill above town for views of the confluence of the Shigar river and the mighty Indus river and views down to the town. In the afternoon we drove up to the reservoir for a break from the heat, a cup of tea and fish and chips with fresh fish from the reservoir. An early start saw us packed into several Land Cruisers on the road to Askole. 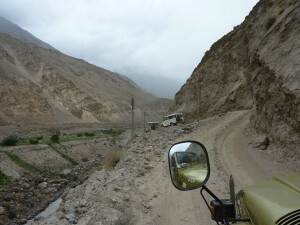 The journey starts on very smooth tarmac but quickly degenerates into a rough off-road track which winds its way along the Shigar then Braldu rivers. 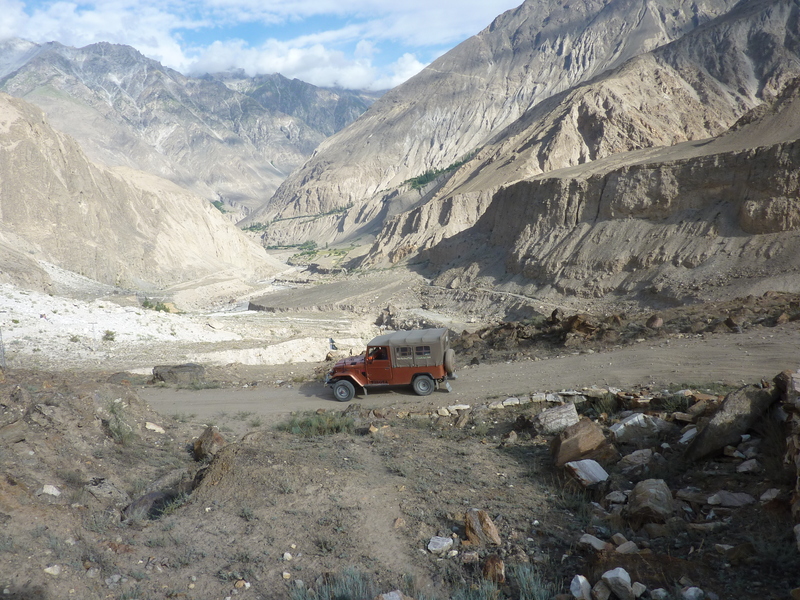 After a brief stop at an army checkpoint and a lovely lunch in the garden of a riverside restaurant, we arrived at the landslide over the road which we had been warned about. It was still very active with rocks bouncing down the slope so it was a quick dash over to a new set of Land Cruisers which were fortuitously trapped on the other side of the blockage. 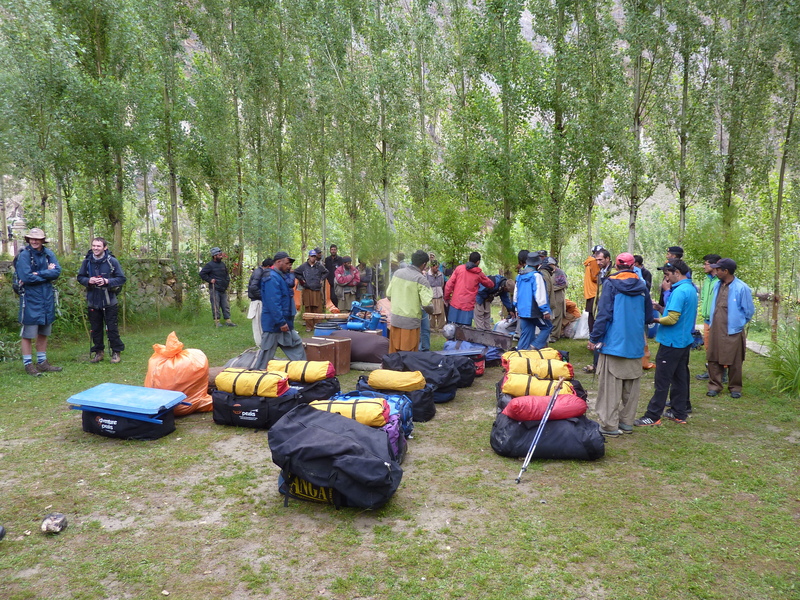 We arrived at Askole, the end of the road, in the rain, however it was a scenic camp spot and our trekking team had the tents up for us and dinner was on its way. 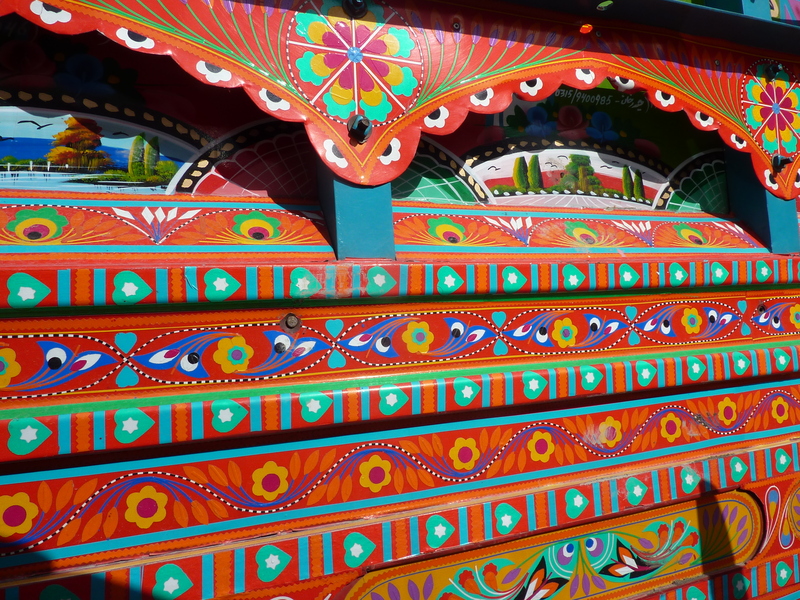 The dinners were prepared by our cook team and being in the Balti region, generally consisted of a simple but really tasty curry, rice, bread and some vegetables. Just the ticket. The next morning the porters divvied up their loads and headed off up the valley. 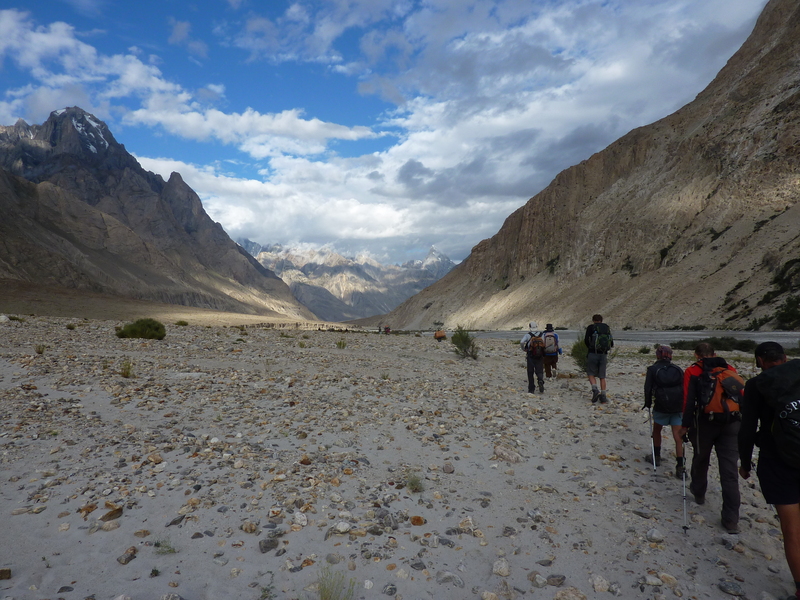 The overnight rain cleared as we packed up and started walking on our first trekking day up the side of the Braldu river. The heat at this altitude is fierce but we had lunch in the shade of some trees before walking past the snout of Biafo glacier to join the Domordo river. 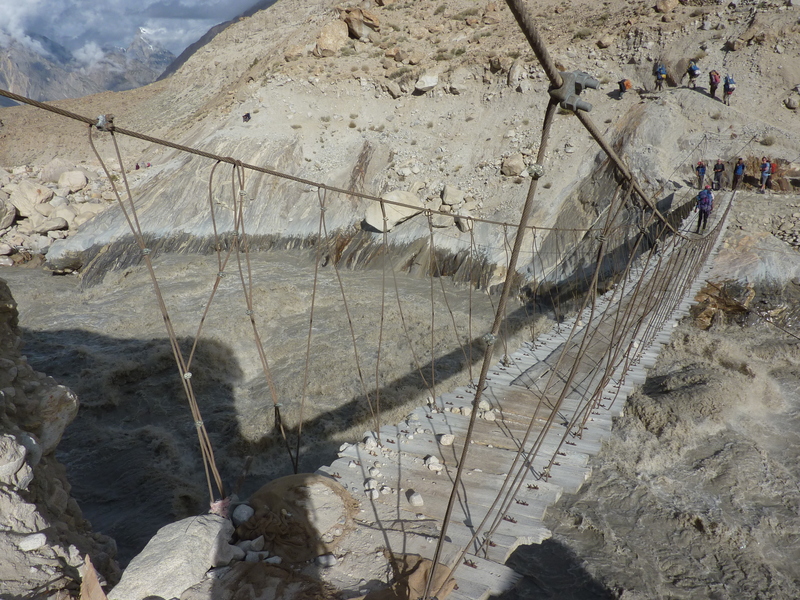 The path built into side of the mountain is very impressive. 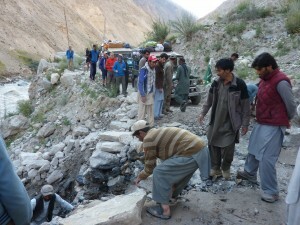 The river has washed away the bank so there is no land left to walk on. Some very well balanced sections of rock have been built into the bedrock to enable an exciting but very smooth walk up the river. 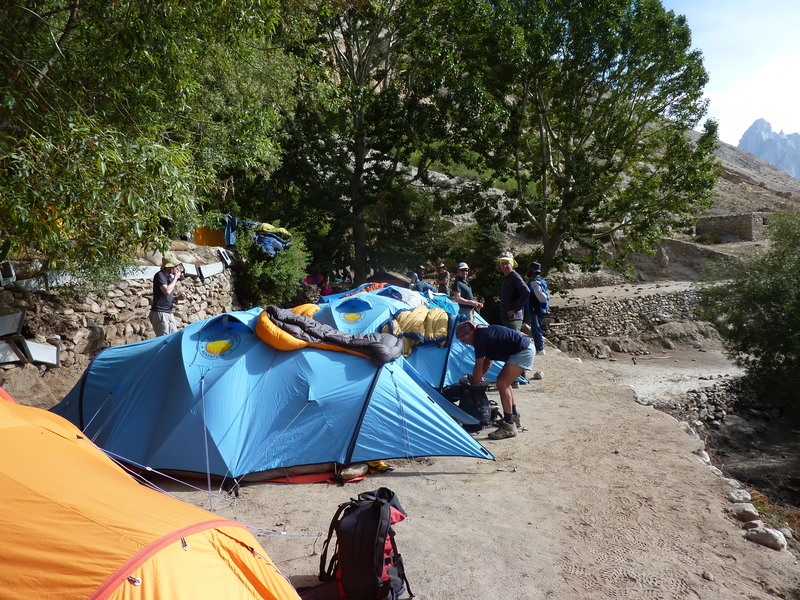 The group were moving well and after crossing the river we followed it back down to Jola camp, set amongst a few trees above the river with some nice flat terraces for pitching the tents. The campsite was very clean and the national park have installed several toilet pods (grey fiberglass pods on concrete bases) to keep it that way. On day two we walked up the Braldu river to Paiyu on a good track. 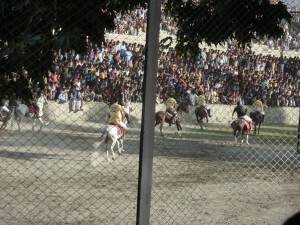 The weather was excellent but if anything, a bit hot. 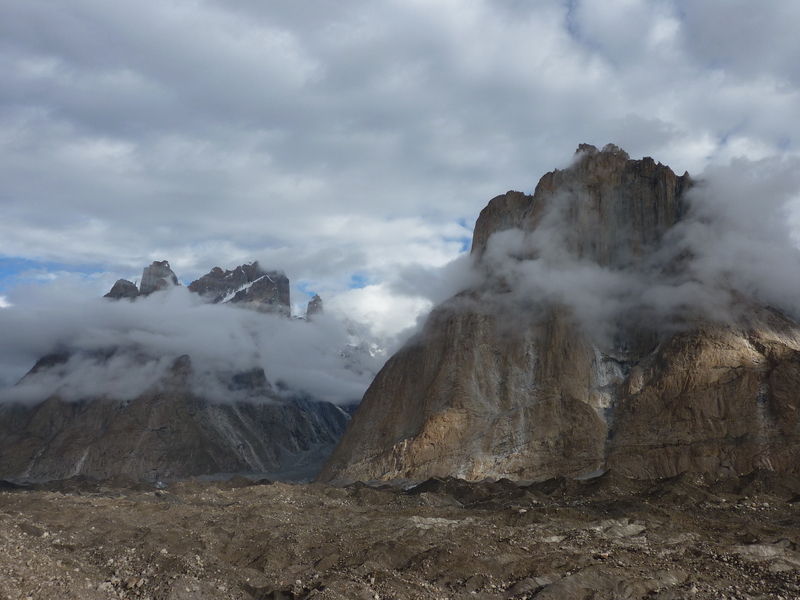 As the valley started to open up, the views were great and the only downer was arriving at camp to find one of the group’s bags was missing. 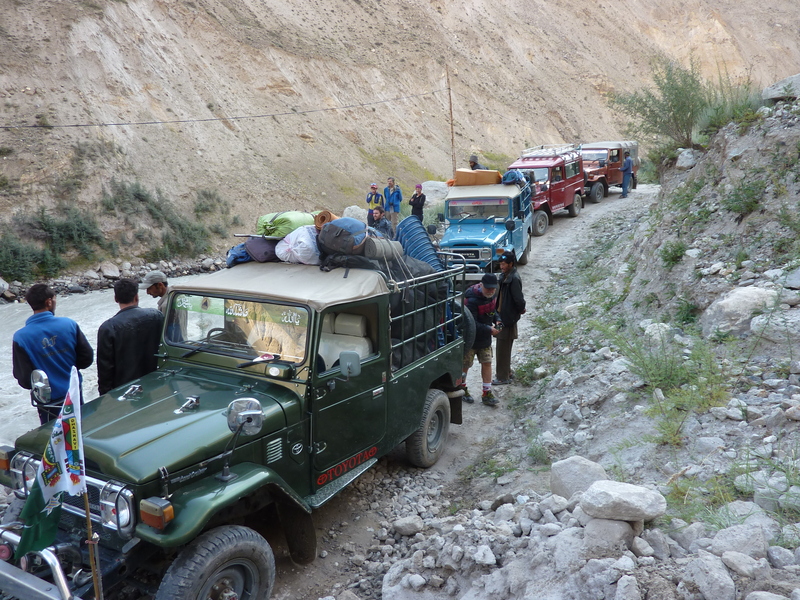 Unfortunately a mule had lost its footing on a steep section high above the river and was lost along with a couple of bags. One bag was found in the flow just downstream that day but it still left us one bag down. 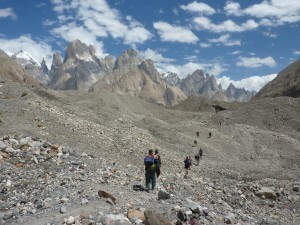 A few frantic phone calls later and we had managed to persuade people from a couple of groups higher up the valley and on their way down to lend us some gear. Crisis averted. 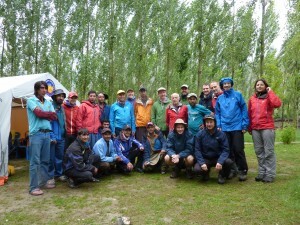 We spent two nights at Paiyu, giving us a free day there, and the porters a rest day. We put this to good use by taking a walk up the hill just upstream of Paiyu towards Paiyu Peak base camp. The path follows a dusty track up the hillside, zigzagging up until a huge house-sized boulder is reached. This is precariously perched on the hillside but provides some welcome shelter from the sun. 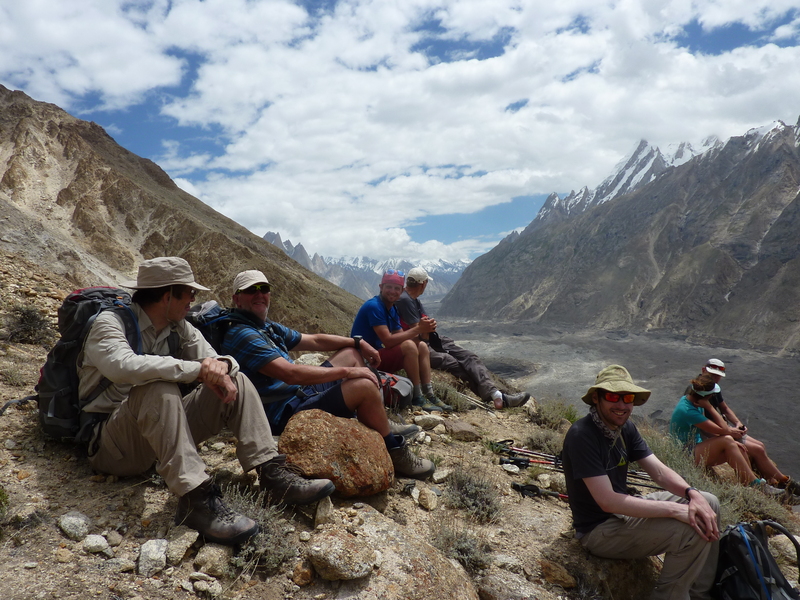 This was as far as we were planning to go so most of the group relaxed for a while then headed down, while others continued up to ‘tag’ the 4000m altitude mark a short way up the hill. 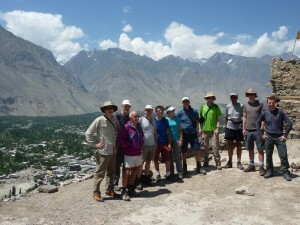 This walk was a great way to aid our acclimatisation and also see some more fantastic views across the valley. Some great news in the afternoon was that the missing bag had been found, intact, and been brought up to Paiyu. 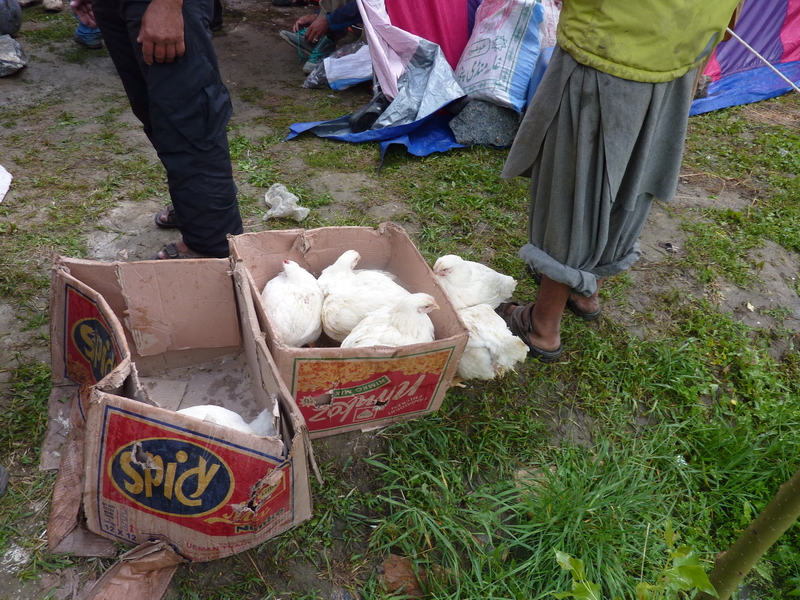 Some other good news – although not for the goat – was that having walked up to Paiyu with us, it was now in the pan. Goat curry for dinner! The following day we trekked to Khoburtse. 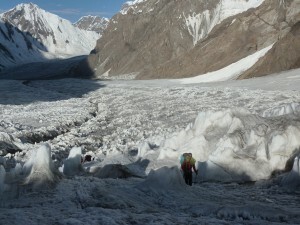 This took us onto the mighty Baltoro glacier which at this height is ‘dry’, i.e. 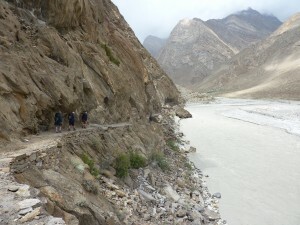 not covered with snow but with a layer of rocky scree in the most part. This makes for rough trekking with lots of ups and downs and very hard going on the ankles but we were rewarded with great views – a running theme by this point! 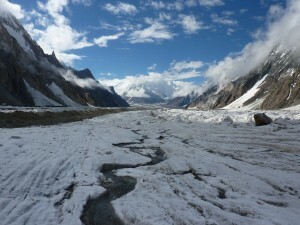 The camp is on the right bank of the glacier, just off to the side past the snout of the first side-glacier on the right, and is a fairly peaceful setting away from the jumbled chaos of the glacier. 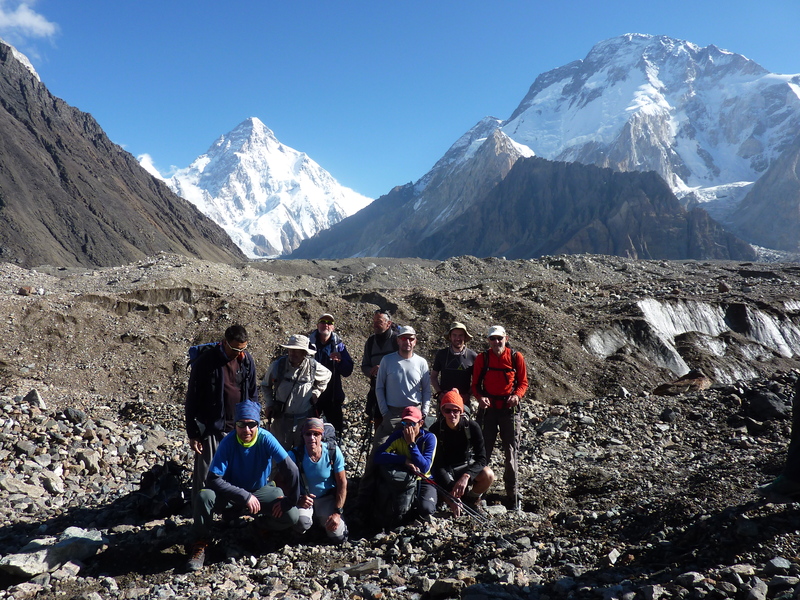 We met the Adventure Peaks K2 team who were on their way down after an unsuccessful attempt (nobody summited this year) so it was good to chat and hear their stories. 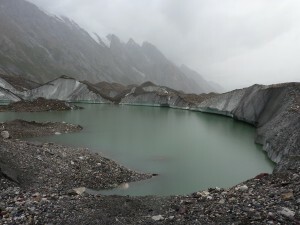 It was fairly long day and as the glacier moves a lot the path changes all the time, in our case the normal route was not passable so we walked over some very fresh loose moraine. 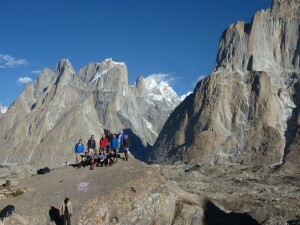 We enjoyed fantastic views of the Trango Towers and surrounding peaks. We continued to Urdukas the next day which was a shorter day but rough going over the glacier. Lots of up and down but interesting features, ice pools and streams cut into the glacier. 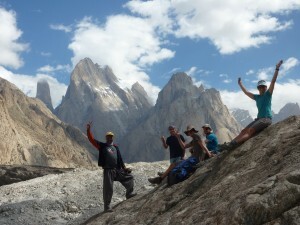 We were treated to clear vistas of Cathedral peak and the Trangos. 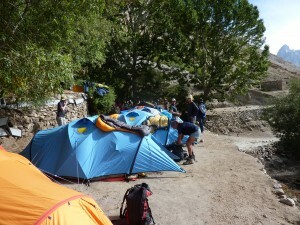 The campsite is very impressive, perched on a spur above the glacier. Comments like ‘it’s far better than in the photos’ were regularly floating around. 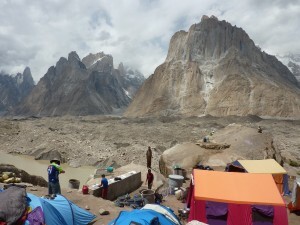 It’s a really nice area to wander round, and has toilets and wash basins with the best view ever! It was only a half day trekking so we had lunch at camp and a nice afternoon relaxing. Highlight of the day had to be the Quiz night, with Pete as our expert quizmaster. The days trekking to Goro and Concordia continued over rough rocky glacier, passing more interesting glacier features and views of Muztagh Tower, Gasherbrum IV, Masherbrum, and a glowing K2 sunset. 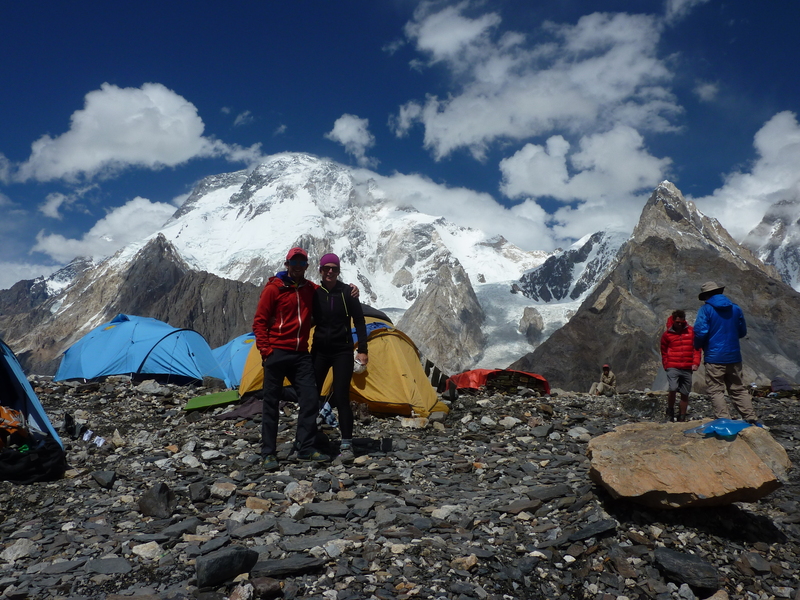 Here had our first taste of camping on the glacier on levelled out tent platforms which made for colder nights than we were used to. There were lots of other people around at Concordia, the junction of two glaciers (Upper Baltoro & Goodwin Austin) so it was a social high and a chance to see some of the locals getting together for a traditional dance singsong. 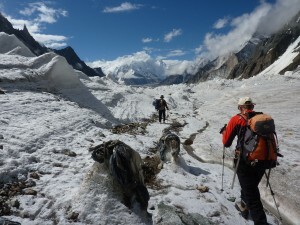 At Concordia you are right under Mitre Peak and Marble Peak, with Broad Peak and Gasherbrum IV just across the glacier. All the big expeditions that were there were on their way down – almost entirely unsuccessful. 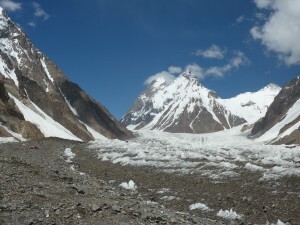 The day to K2 Base Camp had a tough start with undulating terrain and a river crossing but after that the track up Goodwin Austin glacier was pretty steady, with K2 in front of you as you walk. 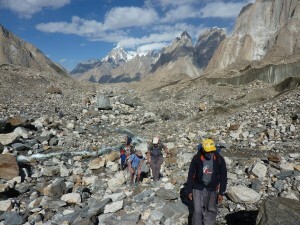 We passed Broad Peak Base Camp which was deserted, and after another river crossing up to K2 BC. 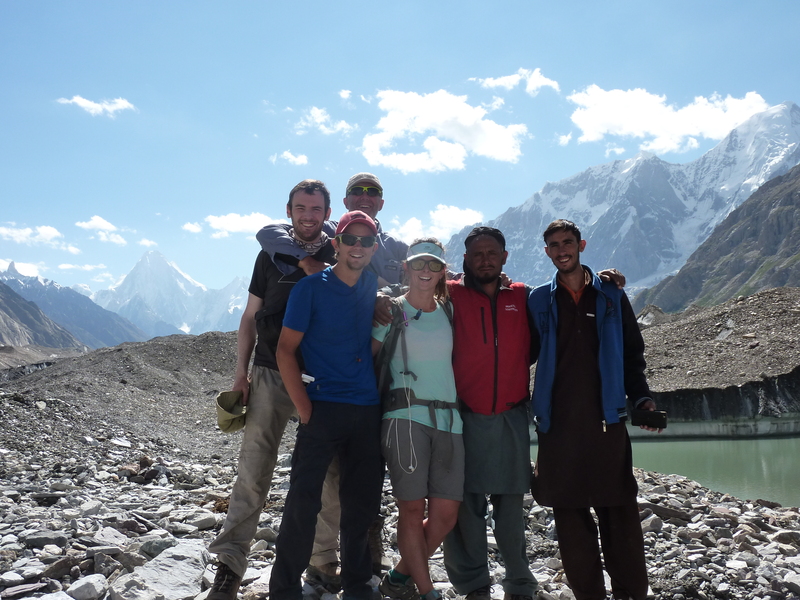 Upon arriving at K2 BC we met the porters who had been looking after the gear left for us by the other group, but otherwise we had BC to ourselves, all the other expeditions having left. 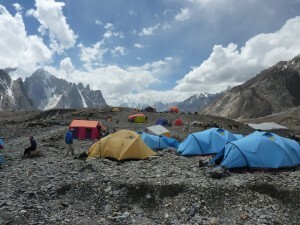 This meant we could use their old tent platforms which saved a lot of time, although because the ice around the tents melts in the midday sun some of the tents looked like they were perched on large pedestals. The camp is situated on a moraine ridge tucked under the southern flank of K2. 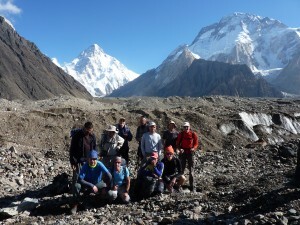 The next day was a rest day for the group. 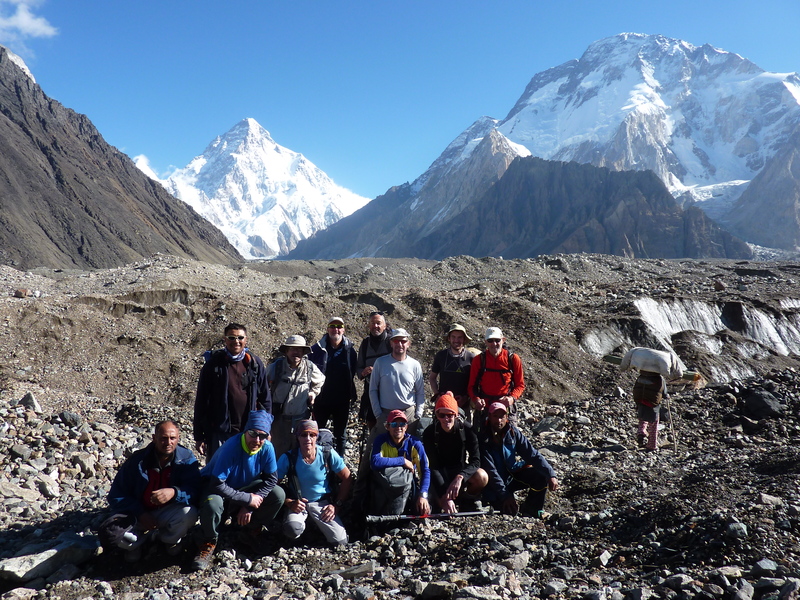 The High Altitude Porters (HAPS) along with a couple of other porters and myself and Tom did a load carry to Kharut Base Camp. 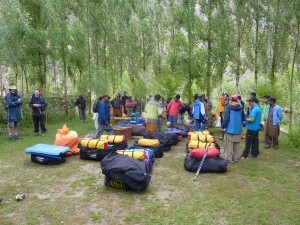 There was lots of fixed rope to carry + tents/stoves etc. 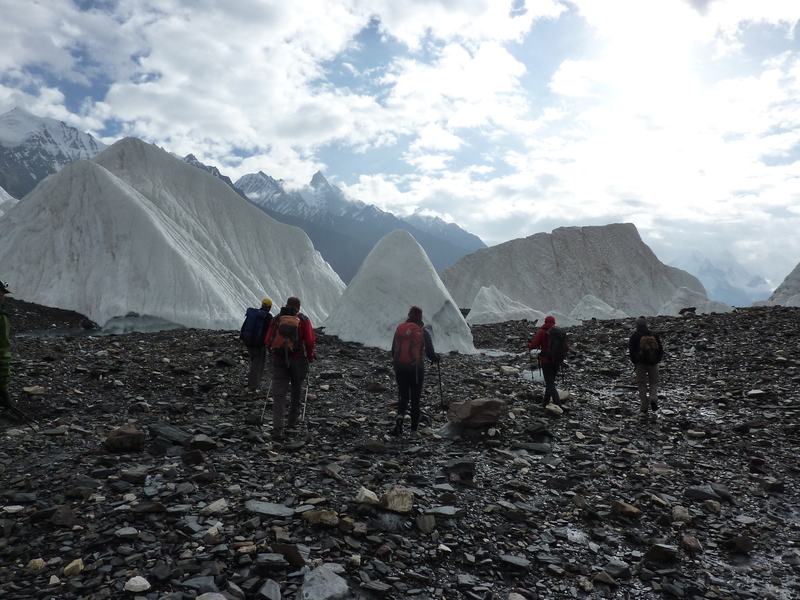 This was also a really useful recce day, letting us have a closer look at the mountain, chat about route options, current conditions, and mark a track across the glacier with wands. 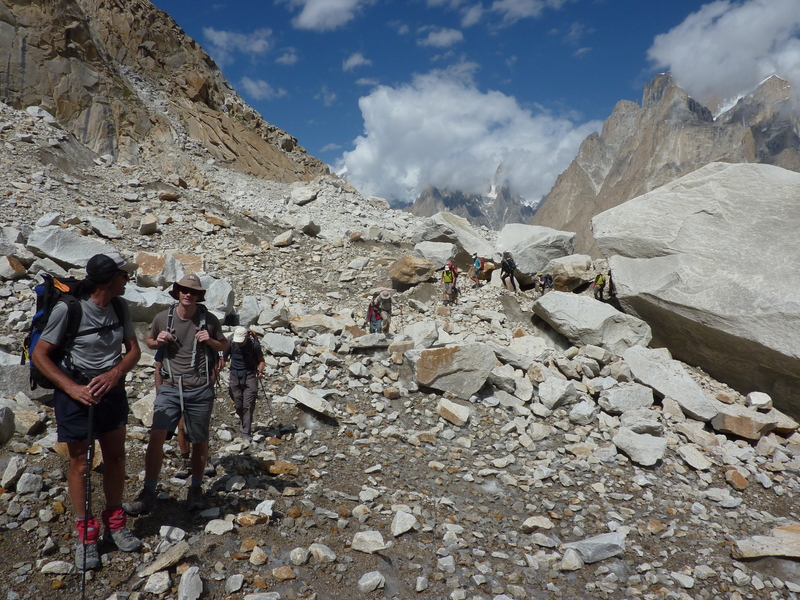 These proved not to be much use as they quickly melted out and fell over, however although the glacier was fairly crevassed and the route complex, there were a number of options and during the 4 trips across it that we made, we went 4 very different routes! 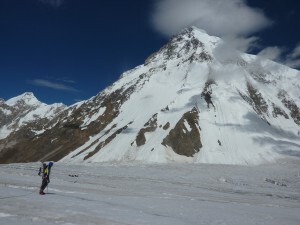 The HAPS stayed up there to fix some rope the following day while the rest of us returned to K2 BC. Heading off to Kharut BC with Mel, Tom and Sophie, the weather was still clear. 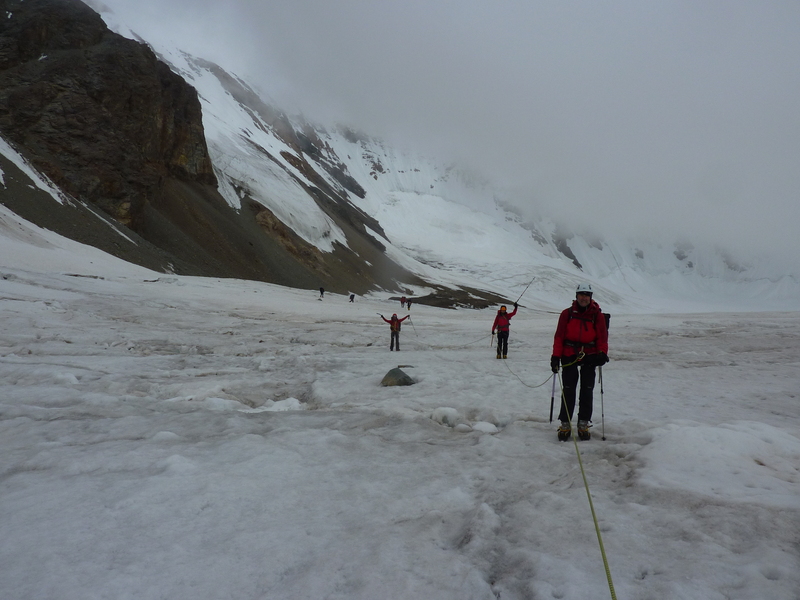 It was tricky weaving up across the glacier as it had warmed up a bit and surface snow was melting fast so there were no tracks from the day before. 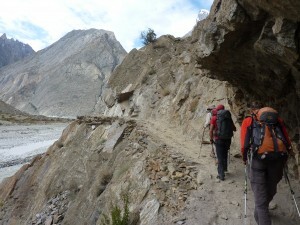 We were relieved to get to camp, which is on a small lateral moraine just off the glacier (crevasses no more than a few meters away on two sides) but far enough from the face above to be safe from any falling rocks from the rock band above us. The face had changed a lot in the day we had been away. 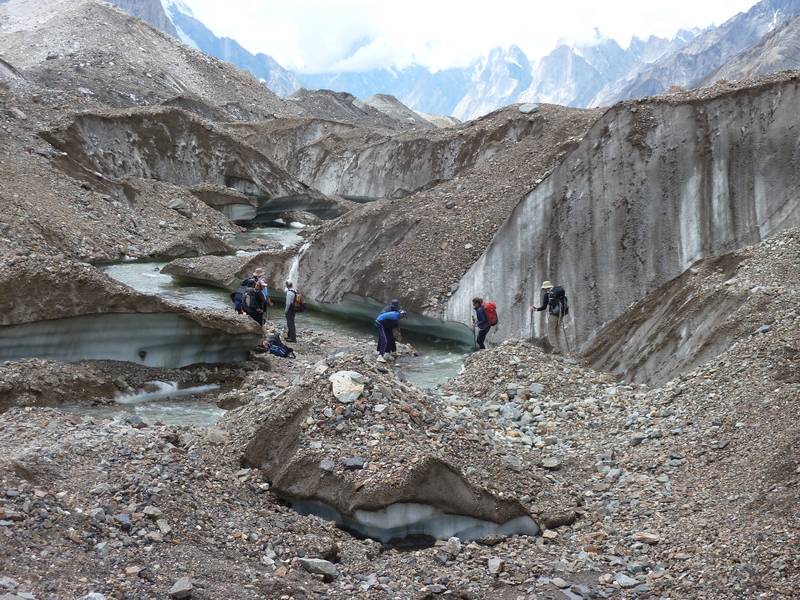 A lot of the snow approach slopes had melted back to bare ice, and the rocky sections were now regularly releasing loose stones which were whizzing down onto the debris slope below. 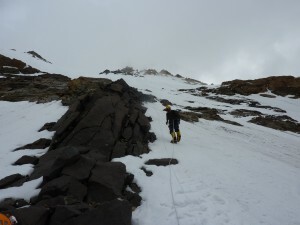 The route options were now narrowed down because of this, and a direct line to the col, straight up the face was now the only option which would keep us out of the firing line. 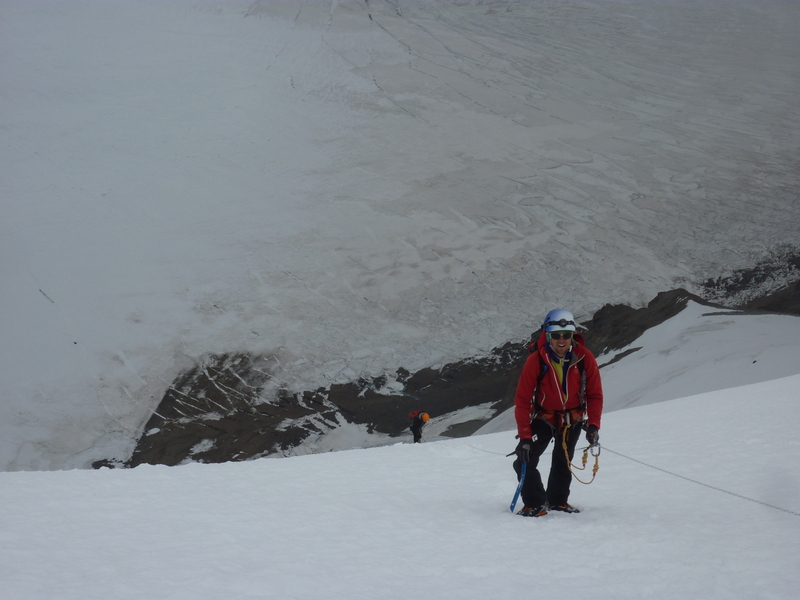 This involved a slog up a large avalanche cone, over a couple of small crevasses, up to the edge of a rock band, then straight up never-ending ice slopes to the col. From there we could follow the ridge to the summit. 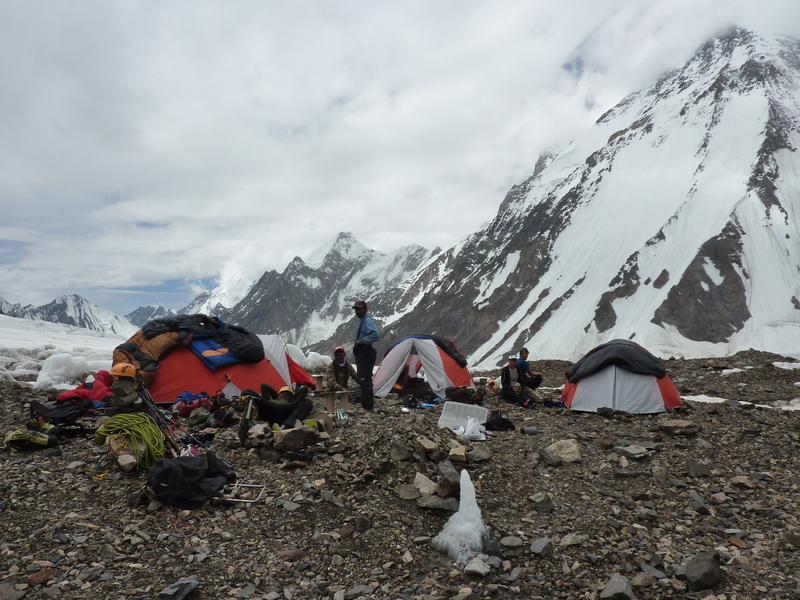 The HAPS had managed to fix rope to about 1/3 height, and moved the rest of the rope up ready to be fixed the next day on our summit bid, and got back to the camp shortly after we arrived. 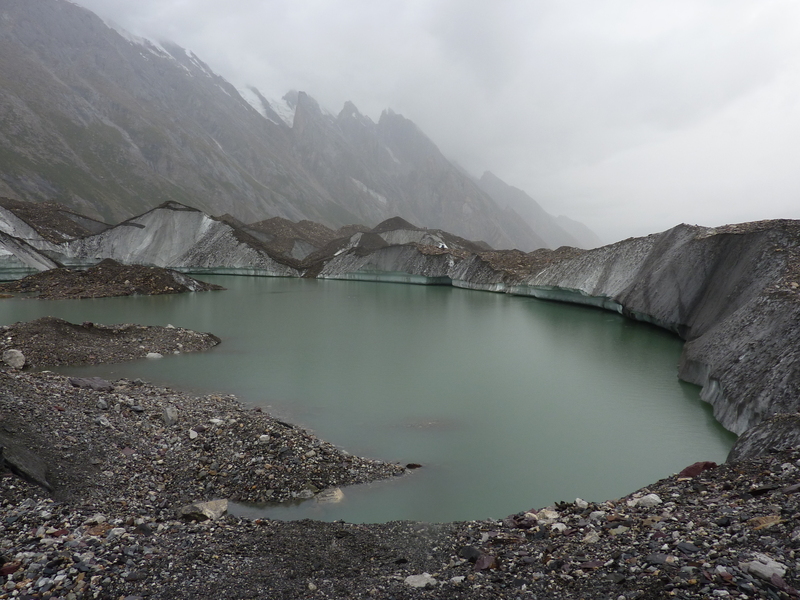 While we were on our way up to Kharut BC, the rest of the team back at K2 BC took a trip down across the moraine to the Gilkey Memorial. Art Gilkey was an American climber on an expedition in 1953, the year before it was successfully climbed. After being pinned down by a storm for 9 days high on the mountain, the team emerged from their tents to discover Gilkey had a condition where blood clots form in the legs. The subsequent attempt at rescuing Gilkey is one of mountaineering’s most epic stories and involved Gilkey being swept off the mountain by an avalanche. 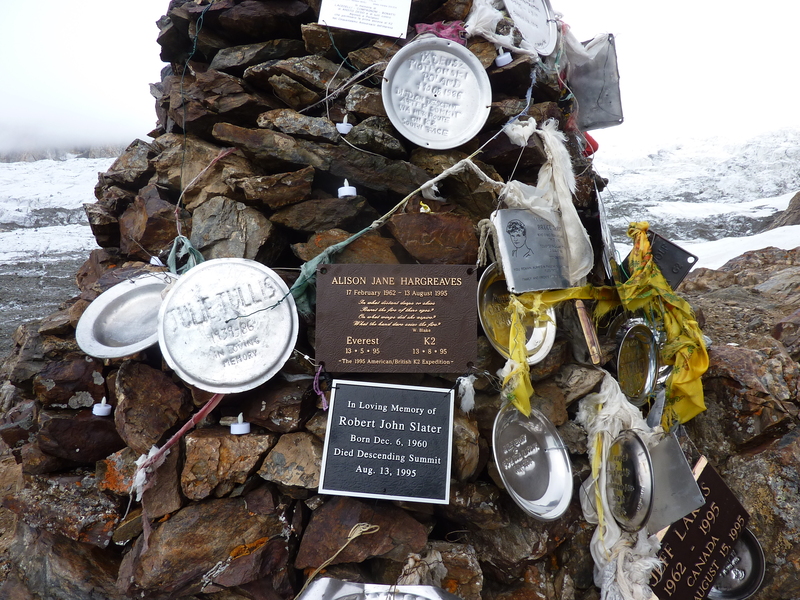 A cairn was built on a rocky outcrop which remains to this day, and there are now dozens of plaques to remember the many climbers who have died on K2 and nearby mountains. Quite a sobering place to visit while staying at BC. Due to the rising temperatures, the decision was made to leave very early on our summit bid for Kharut Pyramid. 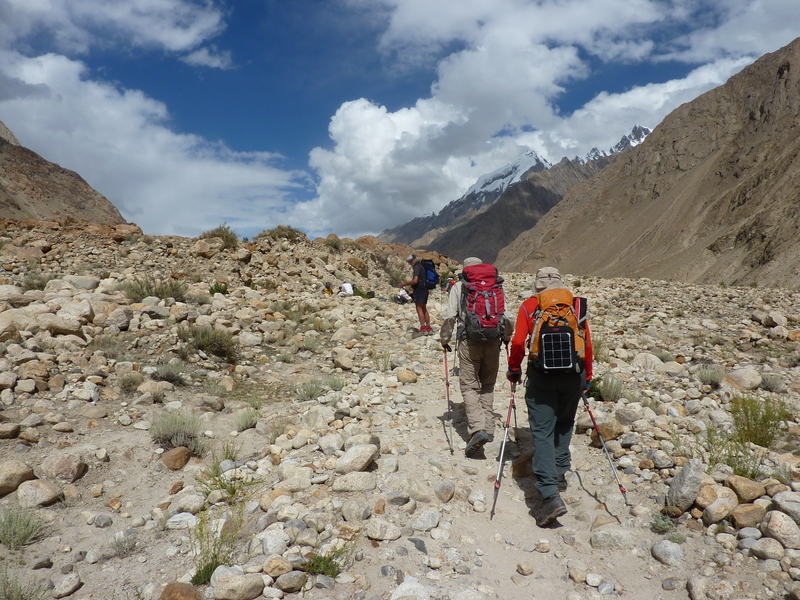 After eating some rehydrated food, and drinking lots of tea and juice, we got a very early night and tried to get a few hours sleep before the alarms went off at 1200. 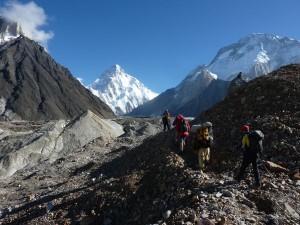 The night was clear when we got up, but not as cold as we were hoping it would be to freeze the snow and lock in any loose rock, but it had cooled down, and we made preparations to leave. As we approached the avalanche cone and the bottom of the fixed ropes it was overheating rather than being too cold that was the problem. Not usually a problem at 5600m at 0100 in the morning. 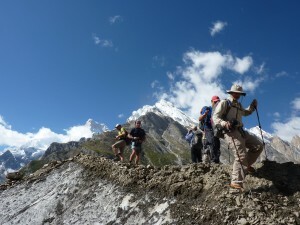 We made slow but steady progress up the first few hundred metres of the slope. The snow in the avalanche cone was soft and hard going so it was nice when we got above it onto the ice slope which provided much more solid foot placements and a more efficient ascent. At this point Mel decided to turn round. 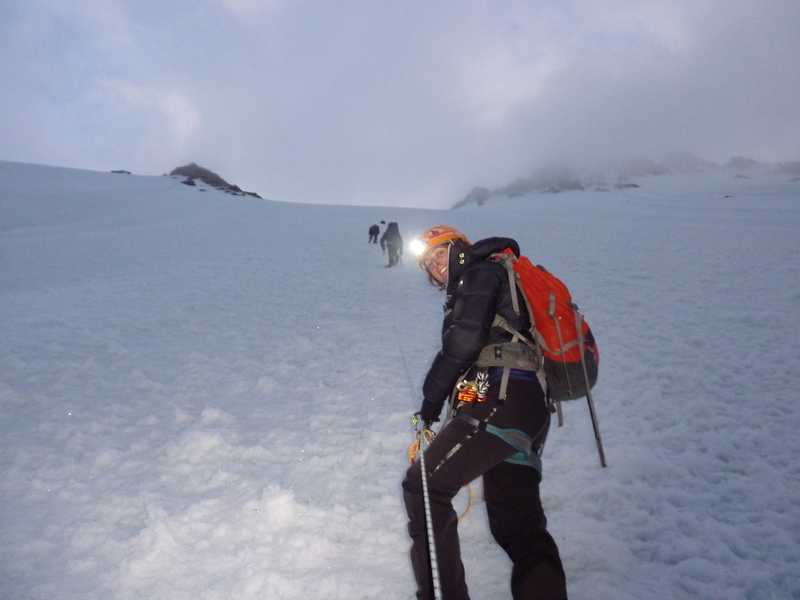 The lower slopes had taken it out of him and he decided he wasn’t going to make the summit. 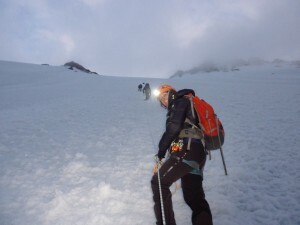 He went down with one of the HAPS and the rest of us continued, progress slowing when we got to the top of the pre-fixed ropes and began the task of fixing as we climbed. As dawn broke the weather had taken a turn for the worst. 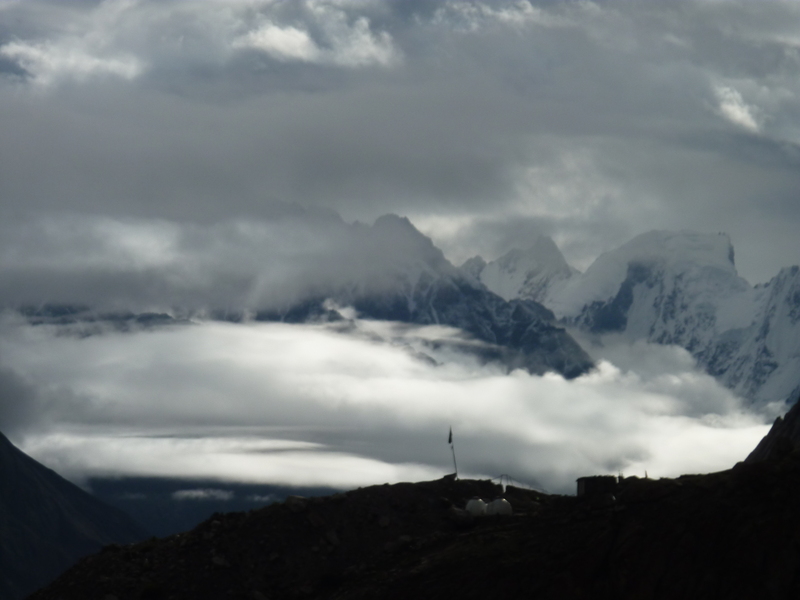 Cloud had formed, obscuring our view of K2 and later the glacier below. The conditions on the face were ok though, although it was warming up with the temperature hovering just above freezing. 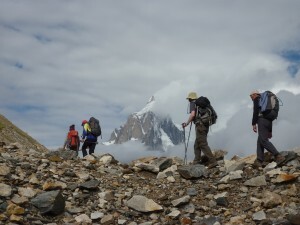 After about 1100 metres of climbing we got to the col on the ridge that connects Kharut Peak (the higher, harder sister peak at 6928m) with Kharut Pyramid (6402m). As we had taken a direct line, this was the second major col on the ridge, slightly higher than the first and closer to the summit of the pyramid. 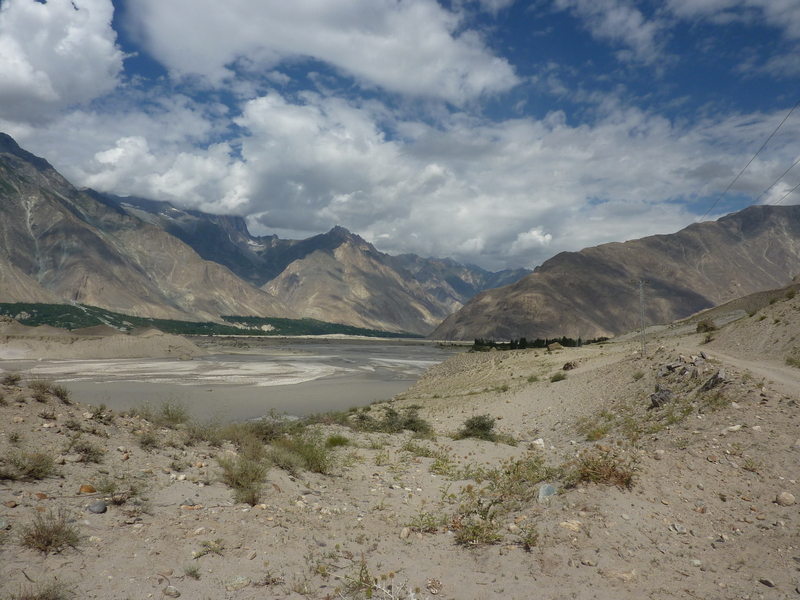 Although the cloud had rolled in, we had some glimpses down towards China, but not the panorama we were hoping for. 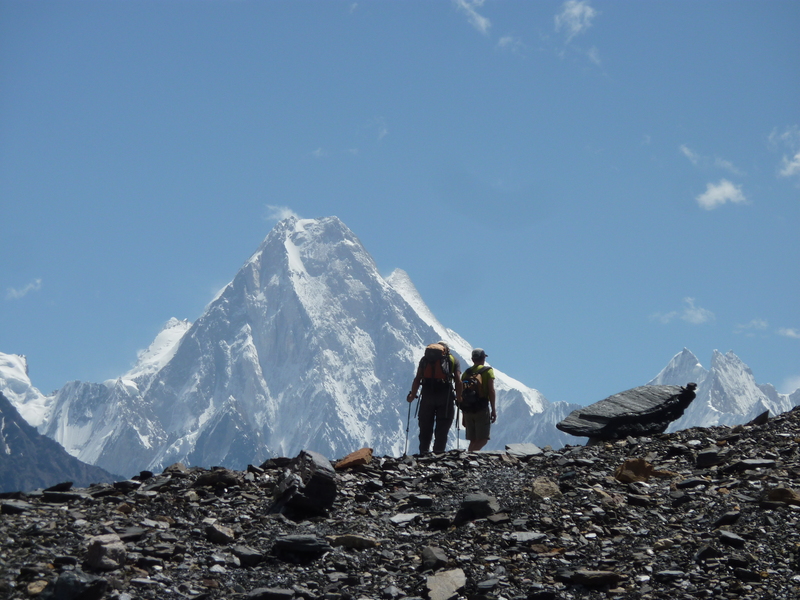 On a clear day you can see countless peaks in all directions with great views of the Abruzzi spur of K2 and the north flank of Broad Peak. 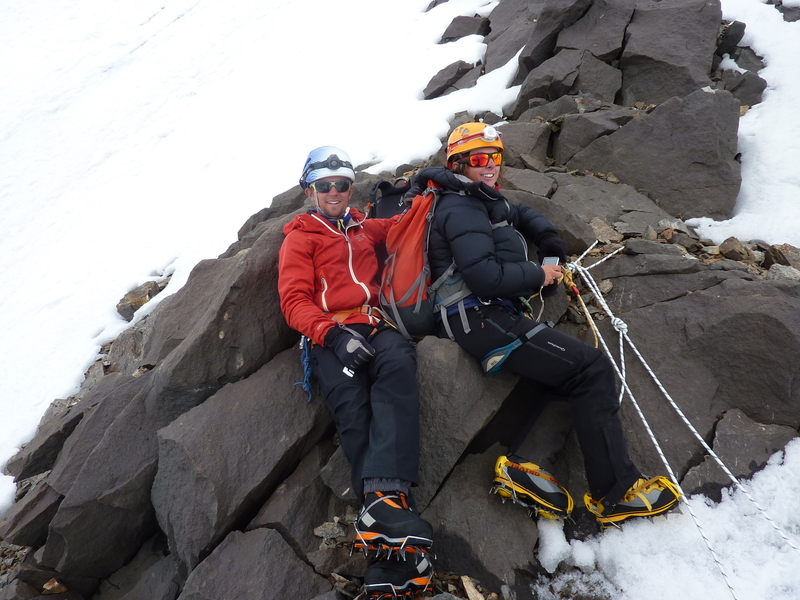 Tom and Sophie decided to head down from the col so I continued up the ridge with two of the HAPS hoping to reach the summit. 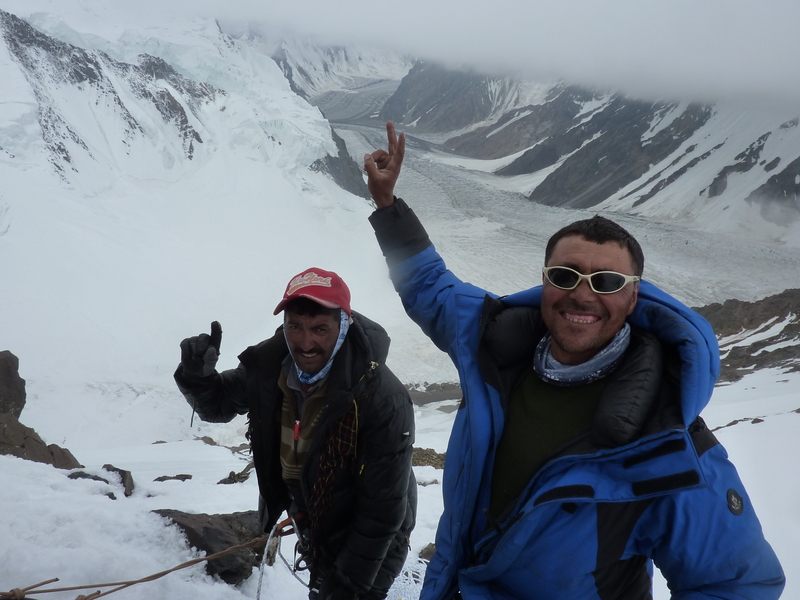 Unfortunately the snow conditions on the crest were very precarious, and the rock on the right side was very loose so after a couple of rope lengths we called it a day and radioed down to K2 BC that we had reached our high point and were preparing to head down. 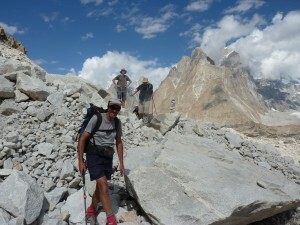 Unfortunately as the visibility wasn’t great they couldn’t see us on the ridge. A smooth decent had us back to Kharut BC in good time but we decided to wait until the next morning before descending the glacier to K2 BC. This was in the hope that overnight the temperature would drop and freeze the remaining snow bridges over the crevasses allowing a safer crossing. Unfortunately in the event it remained warm, and the cloud hung around so it was a tense couple of hours weaving our way around and across the maze of the upper glacier until we reached the more straightforward main glacier. 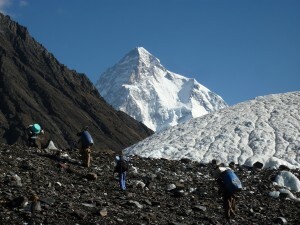 K2 is a tough mountain to climb and many climbers fail to summit, often being forced to abandon equipment high on the mountain. 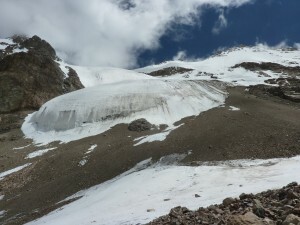 As it’s a very steep mountain, this doesn’t stay put, but is often swept off the peak by avalanches and icefall, landing on the glacier below. What follows is years of being frozen in, churned up and melting out, moving about 4 inches a day on its way down the valley. So we were walking through a ‘museum’ of past expeditions spread out over the glacier. Bits of tent, oxygen cylinders, boots, broken ice axes. 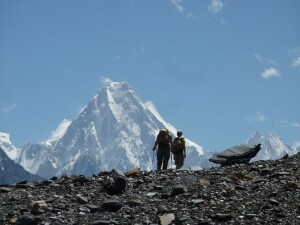 Many of these can be roughly dated by their style or make so a lot of them are a real bit of the history of the mountain. 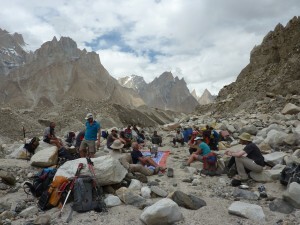 It was good to make it back to basecamp for a slap up meal, and to hear what the rest of the group had been up to. Next day was a snowy start, a real change from the excellent weather we had on the walk up the valley. 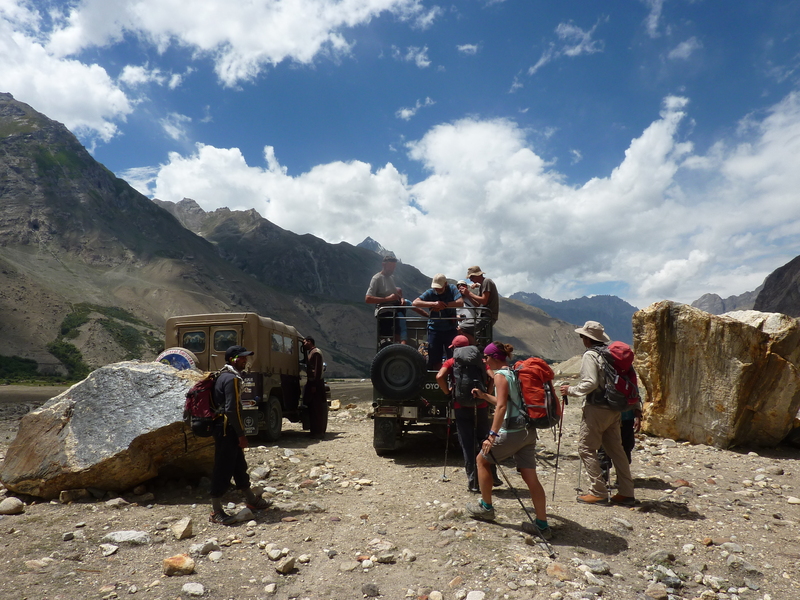 While most of the group started the walk down to Concordia, Tom, Sophie, Mel and I took a detour to the Gilkey memorial before catching them up and continuing down to be greeted by some bottles of coke brought up specially by the brother of our trekking guide. 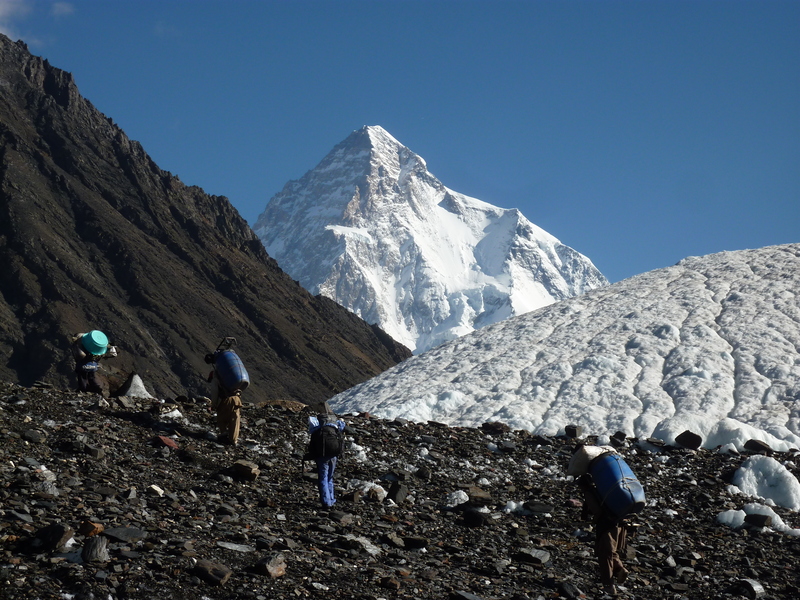 The plan the next day was to trek up to Ali camp which would get us into position to traverse the Gondogora La the next day. This is a high pass into the Hushe Valley, with more outstanding views. 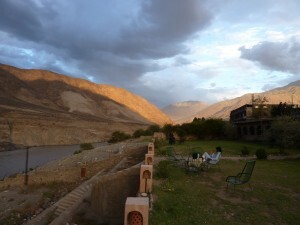 Although the forecast was good, we were woken in the night to rain and in the morning it was still mixed. 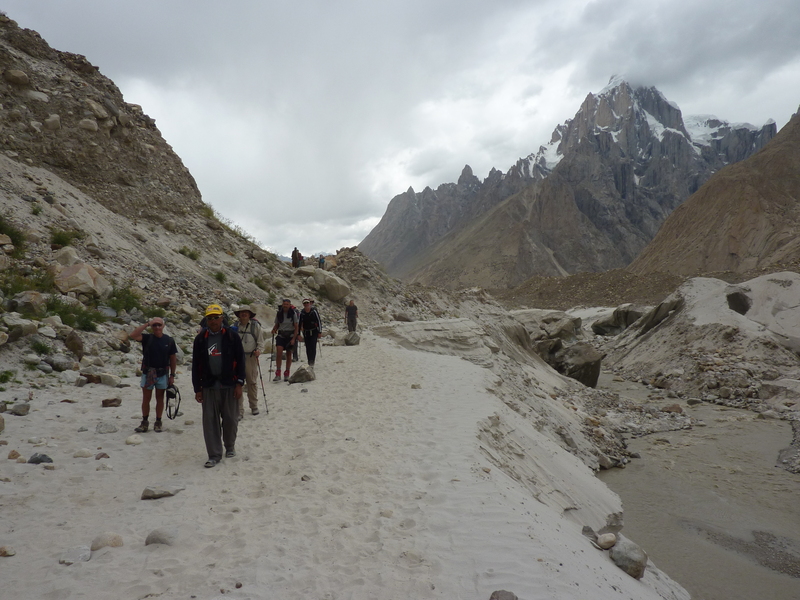 Going over the pass in bad weather was not an option so the decision was made to head back down the Baltoro instead, retracing our steps to Askole. 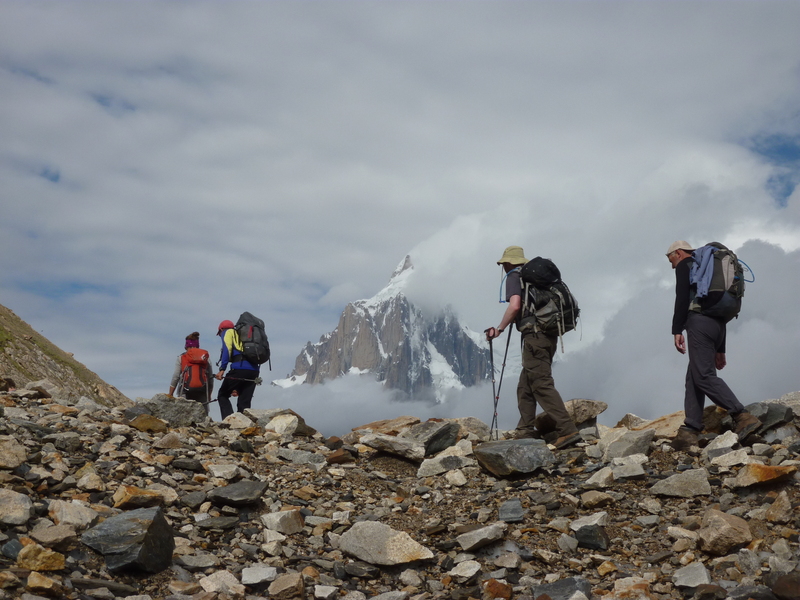 It was a shame to miss out on the Gondogora La and the Hushe valley as everybody was really looking forward to it but our decision was backed up by rain all that evening and overnight. 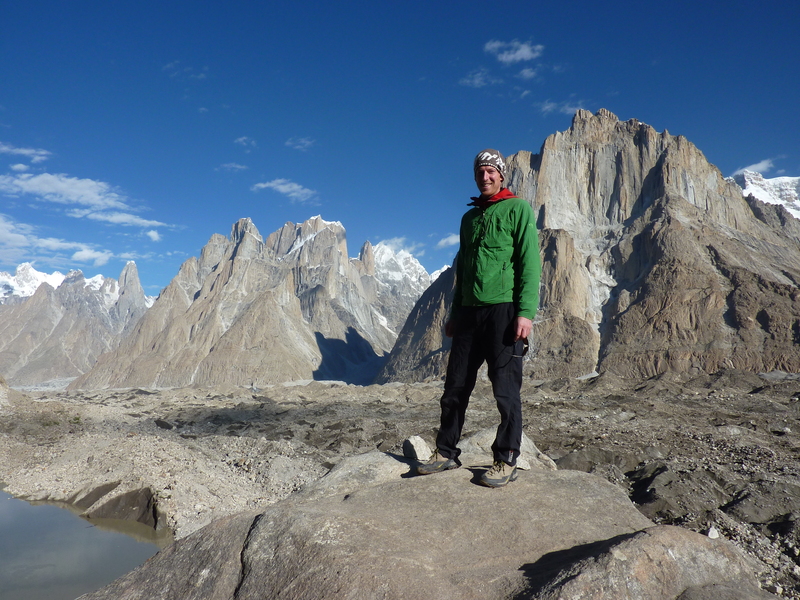 The weather the next few days showed how lucky we were on the way up to get such clear skies and great views of the peaks on either side of the Baltoro. The next few days were long and tiring but we gradually made our way back down the Baltoro glacier and onto ‘dry land’ to follow the Braldu river back to Askole. One of the highlights of the walk down was a good wash in the crystal clear steam at Jola, the first proper wash in a couple of weeks, very refreshing! 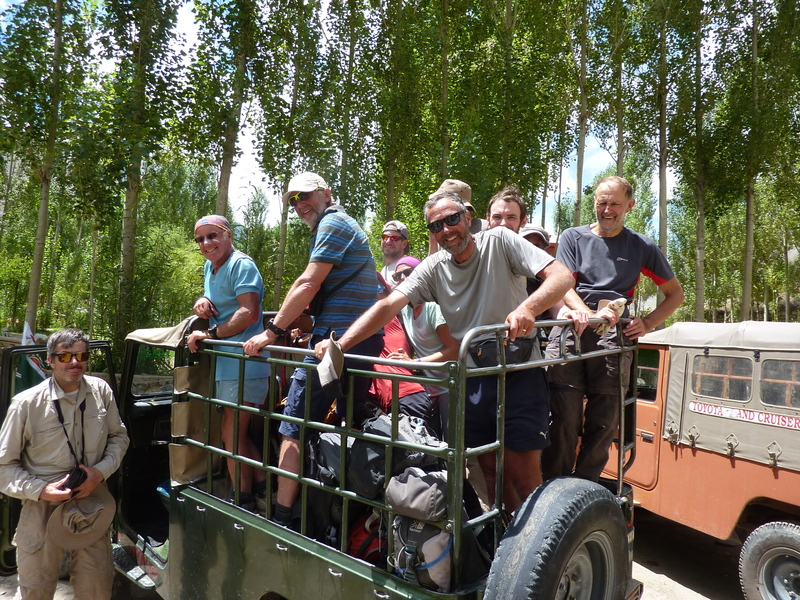 We were greeted by a couple of Land Cruisers a couple of miles short of Askole which gave us a lift back to an afternoon in the garden of the campsite and some ice cold coke. 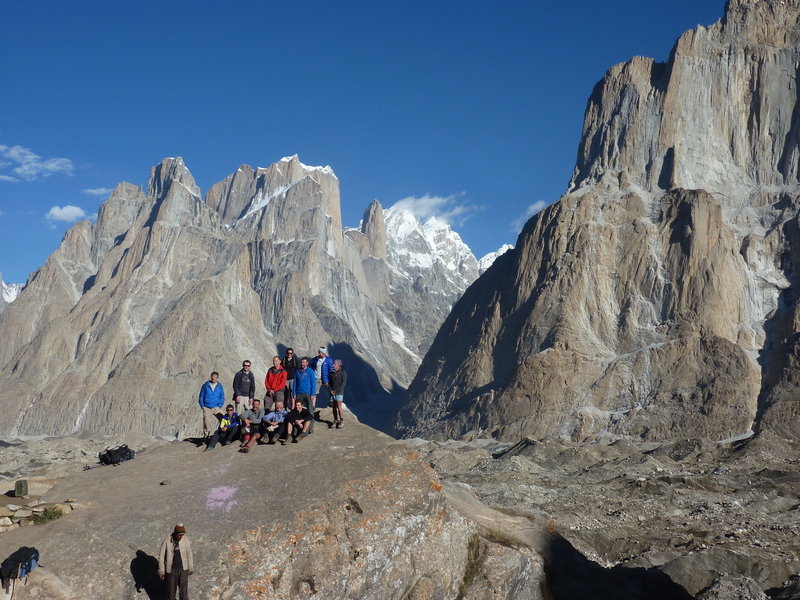 Thank you to the team for a brilliant expedition. Mark is an MIC who spends his winters running courses in Scotland. He is an active climber both in the UK, Europe and further afield. 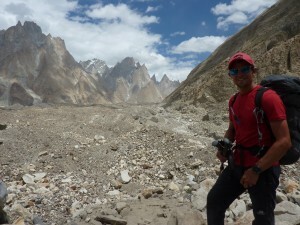 He is passionate about introducing and coaching people in all aspects of climbing and mountaineering.